Condition: Hardcover, with dust jacket. Light foxing. Text clean. The Federation of Malaya is having to make what is probably the boldest experiment the world has yet seen in the development of a truly multi-racial society. The future depends on whether the country will move in the direction of an increasingly bitter communalism or towards an integrated society based on full inter-racial equality of rights. In determining which direction will be taken, the Chinese in Malaya, thirty-eight percent of the population and economically dominant, will play an important part. There have been several accounts of Chinese urban life in Malaya but this is the first major study of an agricultural community by a sociologist. 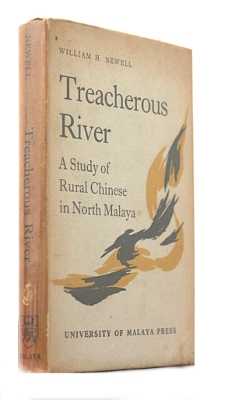 Treacherous River is a village in Province Wellesley which is inhabited by Chinese, who speak the Teochiu dialect of their original home, the Kwangtung Province of China. In this village Dr. Newell lived for a year, learned the dialect and shared the life of the villagers. His study is mainly concerned with the social and religious customs within the village but he also touches on its relations with neighbouring communities, both Malay and Chinese.